Casual Dining 2019 will feature 4800+ buyers & decision makers, 200+ top suppliers, & 20+ free keynotes from the industry's best. 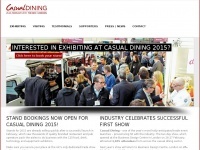 A profile of Casualdiningshow.co.uk was found on the social network Twitter. The web server used by Casualdiningshow.co.uk is located in San Francisco, USA and is run by CloudFlare. This web server runs 5 other websites, their language is mostly english. The webpages of Casualdiningshow.co.uk were developed using the programming language PHP. For managing the data of the webpages the CMS WordPress is used. The website uses the latest markup standard HTML 5. The website does not specify details about the inclusion of its content in search engines. For this reason the content will be included by search engines.